Do you want to inspire a classroom of young scientists? Are you involved in a scout troop, club, or organization looking for an adventure? Do you know some aspiring astronauts? Are you interested in motivating your staff or students to think way, way, way out of the box? 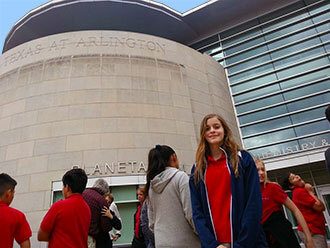 If so, then UTA Planetarium provides the perfect group setting to educate, entertain, and inspire your pack of kiddos! Want to do more on campus? While self-guided tours and bringing a group to experience what life is like on campus can be enjoyable, take advantage of other engaging and memorable experiences on campus. Experience an exciting and interactive science show presented by the Science Ambassadors. Chemistry comes to life with live demonstrations involving dry ice, liquid nitrogen, and fire. To schedule please use their online request form. UTA’s Dan Dipert Welcome Center provides campus tours from 10 a.m. to 1 p.m. daily. There is no charge for campus tours. Having a tour guide on campus can bring to life the rich history and vibrant campus life of the UTA campus. The ShowBook is a list of all the shows we offer. For a more detailed list, please click here. See what it takes to become an astronaut and the effect the environment of space has on the human body. Special lecture by an Astronomer about popular topics. Narrated by Tim Allen, Back To The Moon For Good immerses us in the Google Lunar XPRIZE race to the Moon and the human stories of both the competition and the collaboration it inspires. Bad Astronomy will interest both new and experienced astronomers of all ages as it examines bad science wherever it can be found. Take the ultimate journey in space and time! Learn how mammoth stars make a black hole and help figure out where they might lead. Take an adventure along the spectrum and discover the world of color. Discover Hubble Space Telescope's Cosmic Origins Spectrograph (CoS) instrument, the nature of light, spectroscopy, the use of quasars as background light sources, material identification by spectrum, and the cycling of material within and surrounding galaxies. The search for Dark Matter is the most pressing astrophysical problem of our time, the solution to which will help us understand why the Universe is as it is, where it came from, and how it has evolved over billions of years through the unimaginable depths of deep time, of which a human life is but a flickering instant. But in that instant, we can grasp its immensity and, through science, we can attempt to understand it. Explore the inner workings of Earth's climate engine with visualizations based on satellite monitoring data and advanced supercomputer simulations. Over seven months in the Arctic Circle, crews captured timelapse images of the Aurora Borealis with high resolution digital SLR cameras outfitted with fisheye lenses. The results are spectacular! See the effect of ice in our own ecosystem, and travel to distant worlds to see how ice shapes the landscape and natural systems there. Discover our Magnificent Sun in this UT Arlington original show! Mayan Archaeoastronomy: Observers of the Universe is unique among planetarium shows, intertwining science and mythology to take the viewer on a poetic journey through how the Mayans have viewed and understood the Universe throughout their history. Visit the Classic Mayan cities of Uxmal, Chichen Itza, Tikal, and Palenque to discover how the Maya aligned their temples to watch their sky gods and used interlocking calendars to record the past and predict the future. Nanocam is a fascinating journey exploring life-forms that are invisible to the human eye and contribute to a better understanding of the world we live in. Discover the night sky with Big Bird, Elmo and their new friend from China, Hu Hu Zhu. Set out on a journey to learn about other worlds much like our own oasis in the universe. The title "Phantom of the Universe" reflects dark matter's invisible presence everywhere in the universe from galaxies to deep inside the earth. Pink Floyd is the classic rock that everyone loves. Combine that with the amazing CG visual effects and you have an absolutely amazing show that no one should miss. Dark Side of the Moon runs for 43 minutes. The Wall runs for 67 minutes. Story of the first spacecraft landed on the comet surface. Rosetta spacecraft and "Philae" lander seek clues about the origins of the Solar System and life on Earth. Meet the challenges of a 10 year long mission. Discover winter solstice traditions of the Celtic, Nordic, Irish, Mexican, Hopi, Christian, and Jewish. Learn some astronomical possibilities for the Christmas Star. Join two children on a magical journey through the Solar System, aided by a talking astronomy book, a cardboard rocket, and a vivid imagination. Spacepark 360 is an out-of-this-world entertainment experience. Get transported to surreal vistas and experience the most thrilling amusement park rides the solar system has to offer! The fastest fulldome show continues with 9 all new rides! Travel to ancient Egypt to see how science was used to tell time, make a workable calendar, and align huge buildings. The planetarium documentary 'The Hot and Energetic Universe' presents with the use of Immersive Visualisations and real images the achievements of the modern astronomy, the most advanced terrestrial and orbital observatories, the basic principles electromagnetic radiation and the natural phenomena related to the High Energy Astrophysics. The Sun, Our Living Star tells the story of our nearest star â€” our planetâ€™s powerhouse, the source of energy that drives Earthâ€™s winds and weather, and the ball of light that allows the very existence of life. Four hundred years ago, a simple adjustment to a child's spyglass revealed for the first time an infinite and perplexing universe to our eyes and imaginations. Join us today, as the world's great telescopes, born of that serendipitous moment, gaze farther into the distant past - and into our future. Take a flight on the Stratospheric Observatory for Infrared Astronomy (SOFIA) and discover the secrets of our unseen universe. The beauty of a starlit sky conceals the violent forces at work within our universe. Do you know what an astronomer does? Today's astronomer is not the lone observer of past centuries. We Are Astronomers reveals the global collaboration, technology, and dedication required to answer the unresolved questions of the Universe. So, let's do this! To begin, submit a field trip request. Bring your pack of kiddos to UTA Planetarium and let them Discover the Universe for themselves!